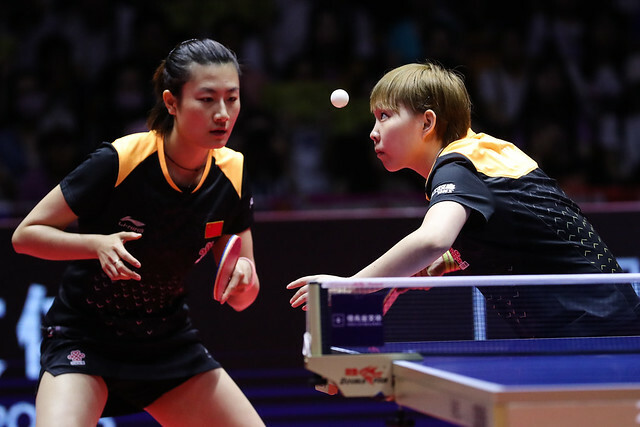 The partner time and time again of Feng Tianwei, in fact semi-finalist at the Liebherr 2017 World Championships in Düsseldorf, in Shenzhen at the Seamaster 2018 ITTF World Tour Platinum, Kaisa China Open, Yu Mengyu proved she is most adept with a different Singaporean partner. Joining forces with Lin Ye, on Thursday 31st May, the duo caused the biggest upset in the opening round of the Women’s Doubles event. They beat the no.2 seeds, Hong Kong’s Doo Hoi Kem and Lee Ho Ching in five games (11-8, 6-11, 11-8, 9-11, 11-6). An unexpected win for Lin Ye and Yu Mengyu, it was the same for Chinese Taipei’s Cheng Hsien-Tu and Liu Hsing-Yin; they ended the hopes of the partnership formed by Spain’s Maria Xiao and Canada’s Zhang Mo, the no.7 seeds (11-7, 7-11, 11-8, 1-11, 11-7). Otherwise it was success for the leading pairs with the host nation very much making their presence felt; Indonesian partnerships being put to the sword. Chen Xingtong and Sun Yingsha, the winners last week in Hong Kong and the no.4 seeds in Shenzhen, beat Novita Oktariyani and Rina Sintya (11-5, 11-7, 11-6). Impressive; it was the same from Ding Ning and Zhu Yuling, the no.5 seeds; they accounted for Gustin Dwijayanti and Lilis Indriani (11-4, 11-9, 11-9). Likewise, there was success for Japan. Hina Hayata and Mima Ito, the top seeds, received a walk-over when due to face the combination of Romania’s Bernadette Szocs and Monaco’s Yang Xiaoxin; Miu Hirano and Kasumi Ishikawa, the no.8 seeds, beat Singapore’s Zeng Jian and Zhou Yihan (12-10, 11-9, 11-9). Mixed fortunes for Singapore, success for Lin Ye and Yu Mengyu, defeat for Zeng Jian and Zhou Yihan. It was the same for Hong Kong; Ng Wing Nam and Minnie Soo Wai Yam, the no.6 seeds, overcame the partnership formed by Germany’s Han Ying and Poland’s Li Qian (11-7, 12-10, 13-11). Meanwhile, in the one remaining first round Women’s Doubles matches, Jeon Jihee and Yang Haeun, the no.3 seeds, overcame Korea Republic colleagues, Choi Hyojoo and Jung Yumi (11-7, 11-8, 11-4). At the quarter-final stage, Hina Hayata and Mima Ito meet Ng Wing Nam and Minnie Soo Wai Yam, Ding Ning and Zhu Yuling confront Chen Xingtong and Sun Yingsha. In the opposite half of the draw, Jeon Jihee and Yang Haeun face Cheng Hsien-Tu and Liu Hsing-Yin; Miu Hirano and Kasumi Ishikawa oppose Lin Ye and Yu Mengyu.